There is nothing better than catching up with friends, and when they are treating you to a nice dinner…well that is just a bonus! We started our evening at Bellwoods Brewery (which you can read about here) tasting local brews and munching on a cheese tray, great preparation for what was ahead. Around 7 we hopped back in the car and headed to my choice of restaurant Nota Bene. I have always wanted to try their burgers and see if they are in fact worth the $25. When we arrived I was expecting a very snotty environment, what I walked into was anything but. The restaurant was packed with people of all kinds. Your typical business types, older ladies getting together for cocktails and dinner and then young hipsters (like my date Bonte – not me…I only wish my wardrobe was as cool as his!). The atmosphere is full of energy, the hum of great conversations, the funky but perfectly hidden background music and the ART! The art is super cool! If anyone knows who painted those amazing pieces email me. It was decided before I entered the restaurant that I was having the burger, however once I took at look at everything they had to offer I was having serious food envy. 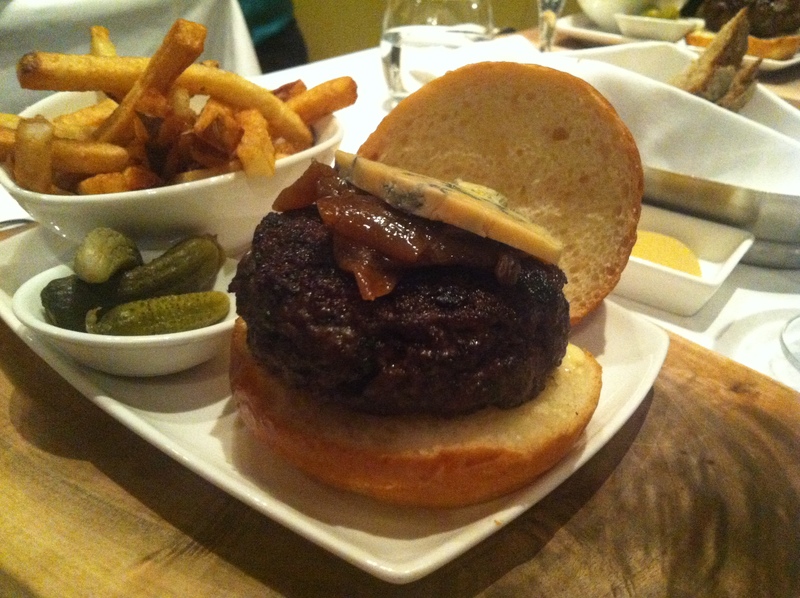 The Halibut caught my eye, but when we asked our server if “this was your last meal, what would you have off the menu?” – Burger it was, so both Bonte and me ordered JENNIFER’S STILTON BEEF BRISKET BURGER. The severing size looks small but it’s not! the burger is packed full of flavour. Basic goodness no filler, from what I could tell, just beef and seasoning, topped with beautiful Stilton and caramelized sweet onions…oh my mouth waters just thinking about it! I ate every last bite, including all my fries (or pommes frites if you want to be fancy). This was all washed down with a lovely Cabernet but due to 2 glasses with dinner…and a martini I can’t remember the name of it! Thanks EXECUTIVE CHEF – DAVID LEE and CHEF DE CUISINE – GEOFF O’CONNOR you have just taken first place in my hunt for the cities best burger! And most of all thanks Bonte for a great night, I owe you dinner now.